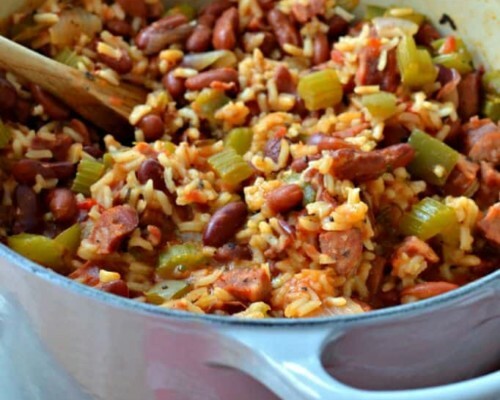 My version of Red Beans and Rice is all cooked up in one big pot. 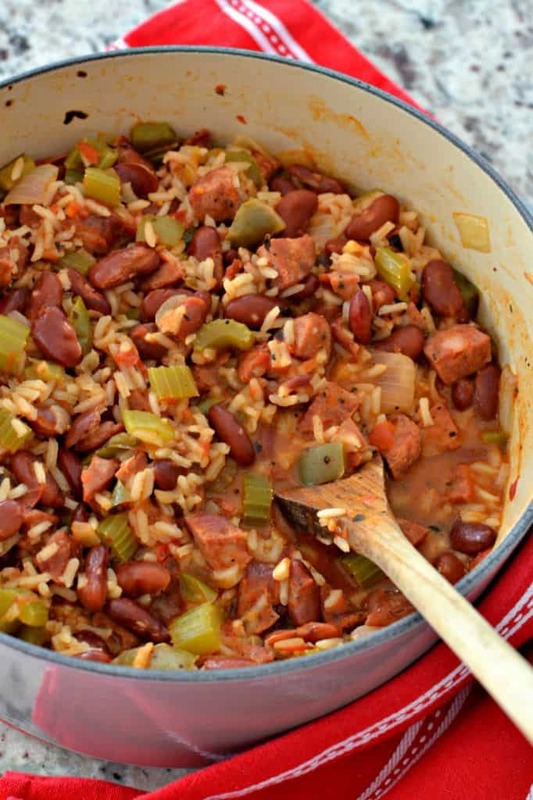 This mouthwatering combination of onions, peppers, celery, Andouille Sausage, red beans, rice and a perfect blend of spices is a super hearty flavor packed meal. So before we dive right into this Red Beans and Rice I have a confession to make. I know that I will never get one over on the folks from down south. They are very serious about their Cajun cooking! The pictures you see here have kidney beans in them which are not to be confused with red beans. I made plans to make this last weekend. Friday is shopping day but it was also the first day of a huge snow storm. My son and I got to the store before the storm started which is a really good thing because this middle aged woman does not like to drive in snow storms anymore! Well the grocery store looked like the battle of Armageddon. The area where blocks and bags of shredded cheese are stocked was just an empty void. We had to purchase brands and sizes that we don’t normally buy and of course there were no red beans. I grabbed the last few cans of red kidney beans and keep moving right along in hopes of getting home before the streets got bad. So there is my disclaimer. So the next time I make this with “red beans” I will retake the photos. That is if the lighting is good and I don’t suffer some kind of memory loss. What are Red Beans and Rice? 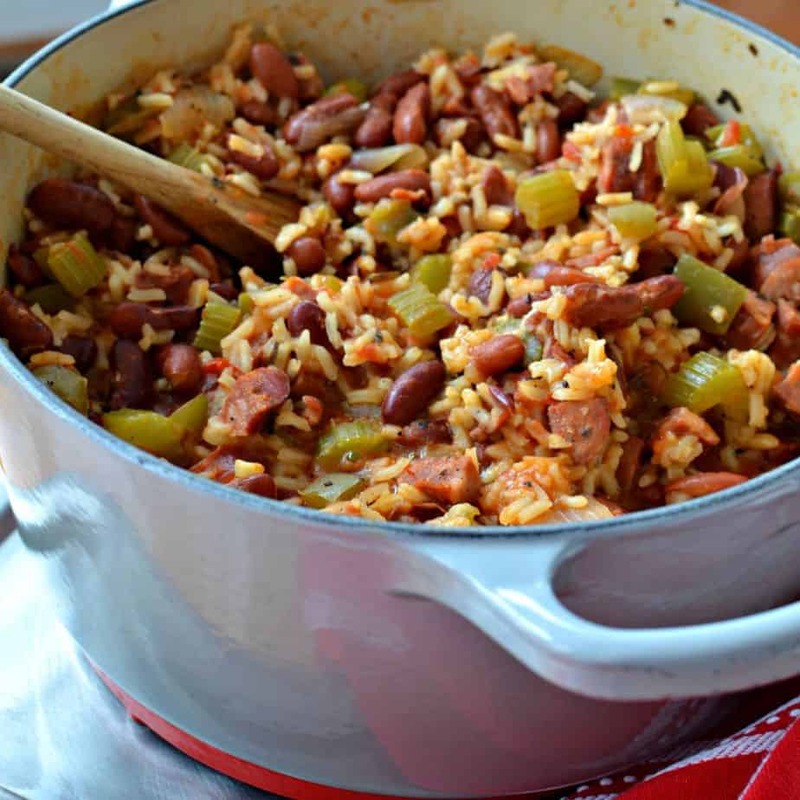 Red Beans and Rice are a New Orleans Style Cajun meal in which red beans are slow simmered with vegetables, sausage and/or ham and Cajun seasoning. Traditionally served on Mondays utilizing the leftover meat from Sundays supper however anytime is a great time for Red Beans and Rice. It is usually spooned over a bed of rice but in my one pot version the rice cooks along with the rest of the goodies. How do you make Red Beans and Rice? I like to make this in my dutch oven however any good heavy pot with a tight fitting lid will work. Start by heating a little vegetable oil in the pot over medium heat. Add the onion, green pepper, celery and sausage. Cook until the onions soften and the sausage lightly browns. This will take several minutes so stir frequently so nothing gets too crispy on the bottom. Turn the heat down to medium low and add the garlic, oregano and Cajun seasoning and cook for one minutes. Then add the red beans, chicken broth, tomatoes, and rice. Bring to a low boil, turn down to simmer and cover with a tight fitting lid. Cook for fifteen to twenty minutes. I like to check it after about fifteen minutes to make sure that nothing is cooking too much at the bottom of the pot. Andouille Sausage is smoked sausage typically used in Creole and Cajun cooking. It is made of pork, garlic, onions, pepper and seasonings. 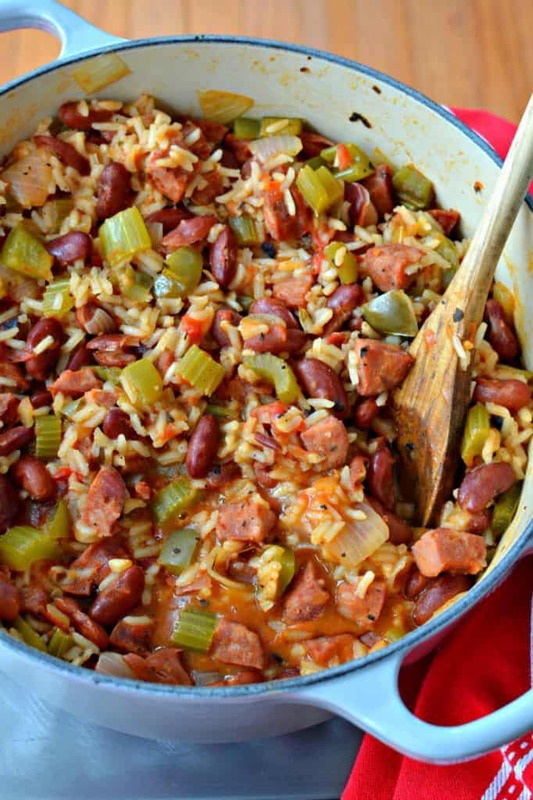 This delectable sausage is great with more than just Cajun style cooking. It is delicious with eggs and in omelettes, creamy soups, and cheesy casseroles. Most of my local grocery stores carry this sausage and one of them even makes it fresh. Boy that is a really good question since they share so many of the same ingredients and spices. Perhaps the simplest way to explain the difference would be to look at the people who cook the dishes. You might refer to Cajun cuisine as “country food” and Creole cuisine as “city food. Though the two cuisines have a lot in common they each come from two distinct cultures. Creole cuisine uses tomatoes and authentic Cajun cuisine does not. You might have heard of the Cajun Holy Trinity – onion, celery and bell pepper. Creole food is considered to be more varied and sophisticated than Cajun cuisine however we love both styles of cooking. I am sure that my Cajun loving readers will tell me that it is not right to put all of this in one pot but I am a busy lady and sometimes that means making things super easy! This Red Beans and Rice is power packed, full of flavor, easy and quick making it the perfect busy family meal. Put it your to try list and let me know what you think. Made this. Real good.. Except i think needs less sausage and less rice. Made too much..
Glad that you liked it. Maybe next time you should cut it in half. Oh I just made this and it is delicious!!! I will make this one again! Yummy! Thanks Theresa! We love it too! EXCELLENT RECIPE!! cannot believe how good this is for a random internet pick. Amazing!! I only added some extra cajun seasoning as we like things spicy . and salt and pepper to taste. Will definately make again! Thank you so much . Love this!!! Thanks so much Kimberly! I appreciate your kind words! I am sure that it can be adapted to a crock pot. So many amazing flavors in this dish! I swear that andouille sausage makes everything better. Thanks for such a great recipe! You are most welcome! I agree!I love andouille sausage! I agree! You are most welcome! I sure hope you enjoy it! I absolutely love one-pot recipes. Thanks so much for sharing this! My pleasure Sandra! I love one pot meals too! How yummy is that. This is the kind of thing I love to make on a cold winter day. This is the perfect balance of celery, sausage and beans! Spot on recipe! this is like the ultimate comfort food. 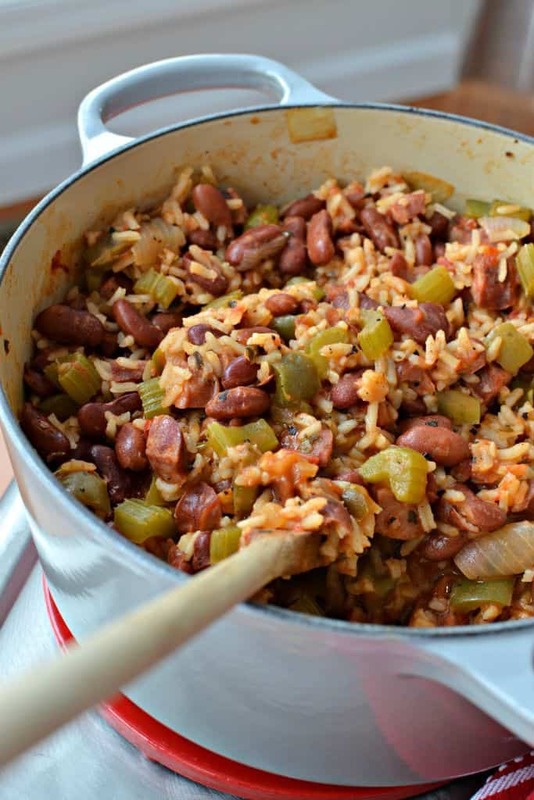 red beans and rice brings me right back to new orleans – love the flavors! I love beans but I love red beans the most. YUM! I’m going to have to try this one day. Thanks Louise! It is very delicious! You should give it a try!! I tried this recipe and it is fantastic. I think it will become a monthly go-to recipe. Thanks so much Deanna! We love it too! Oh my goodness, this looks so tasty. I can’t wait to try this. Thanks so much Sue! It is a delicious recipe! I hope you enjoy it as much as we do! Yummy, such a lovely recipe with many of my favourite herbs and seasoning. Need to try this recipe! Thanks so much Courtney! I hope you enjoy it as much as we do! It looks like a good recipe for me to try. It look so delicious and easy to make, I am sure my husband and my kids will love it. Awesome! I hope you enjoy it Catherine! I really think you would do fine! Give it a whirl Becca. You will love it!! Thanks Pati! It is delicious! I hope you give me a try! Great recipe. I love Cajun food and I will def. be trying this recipe very soon. Very good. Added a heaping teaspoon of smoked paprika. Turned out amazing. Did and the diced tomatoes for richer flavor. Thanks so much Susan! I am glad that you liked it!! I will try the smoked paprika! Thanks Janice! I am glad that you liked it!